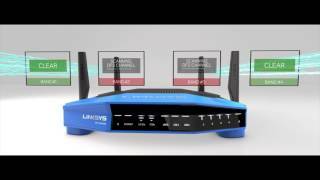 Linksys WRT3200ACM AC3200 MU-MIMO Gigabit WiFi Router is rated 4.0 out of 5 by 332. Monitor and control your home WiFi network from anywhere through the Linksys Smart WiFi website or mobile app. Bring ultra-fast AC WiFi to your home with the one and only WRT3200ACM MU-MIMO Open Source WiFi Router. Equipped with Tri-Stream 160 and premium MU-MIMO technologies, this open-source router delivers blazing-fast, uninterrupted dual-band WiFi speeds to multiple devices at the same time. Equipped with innovative Tri-Stream 160 technology, the WRT3200ACM delivers untouched, extreme WiFi speeds that never lag. Not available on other WiFi routers, Tri-Stream 160 effectively doubles the bandwidth of the 5 GHz band to power data-heavy activity with ultra-fast 2.6 Gbps WiFi speeds. Dynamic frequency selection (DFS) certification from the FCC not only allows operation at 160MHz enabling Tri-Stream160, but it also triples the channels available at 80MHz, so your router can operate in the clearest airspace that other WiFi routers aren't allowed. Thanks to MU-MIMO technology, the WRT3200ACM router can handle even the most bandwidth-intensive environments. MU-MIMO builds upon longtime broadcasting cornerstones--such as spatial multiplexing, beamforming, and scheduling algorithms--to boost overall throughput and distribute WiFi bandwidth fairly between devices. Each connected client device receives its own dedicated data stream, so users won't have to compete with one another for bandwidth. Multiple users can simultaneously engage in 4K video streaming, play online games, and perform other data-intensive tasks without latency or buffering. Equipped with an enterprise-grade dual-core processor, the WRT3200ACM packs the computing power needed to handle even the heaviest network traffic and deliver the lowest latency. The result is a fast, responsive home WiFi network that never lags. Rated 5 out of 5 by Denny from Awesome router with great speed and coverage! Setting this router up was very easy. Plug everything in, run the software, give the networks names, and that's pretty much it. I was replacing a router so I gave it the same name and password as my old one, so all of my computers and 38 devices connected automatically. I love the network map that comes with the software, It lets you see everything that is connected to the network, along with their MAC addresses. If you know the MAC addresses of your computers and devices then you can edit the names and their images on the network map to easily identify everything. I did set this up to give high priority service to some devices like Ooma (Voip) and that worked well too. Rated 5 out of 5 by ron45 from Super fast and smooth!!!!! I have had this unit for about 3 weeks now and I am really impressed. I was looking to replace my wrt1900 with something that could handle multiple devices more easily. This unit seems to do that and does it quickly!! When I think about how many devices use Wi-Fi in my home it's astonishing(2 xbox ones,1 ps 4, 2 laptops, 4+phones etc...). In my house range has always been an issue the 3200 has great range I am not even using my range extender!! The WRT3200acm makes all these things run fast and smooth(meaning no resets!!) I am really pleased with this device as with all my Linksys products and their performance is great!! Rated 1 out of 5 by Richard from Settings reset after a few days Running router with stock linksys firmware. Within the last week, personal settings on the router mysteriously reset on it's own. Prior to personal settings being reset, I was getting an error after login so I performed a hard reset and re-input all my personal settings. This fixed the error message from appearing after login. After about 2 days of running, unable to access local UI on router. Needed to power cycle the router to login to access router's local UI but personal settings for the router somehow lost. Need to re configure router again but within 2-3 days unable to access local UI for router, also router settings lost. Rated 5 out of 5 by Kaleun from Super-fast, reliable router! My 5-year old N-router stopped working. I found this one at a reasonable price, only a little more than an equivalent. I will admit I had to use the 800 number for help to get it working, but in 30 minutes, I was connecting to my Samsung (Barnes and Noble) e-Book, and getting fast downloads to it (music), AND I believe this router, with the 1-year 800 number support, will meet unanticipated future needs, which is why I sprang for the extra cost. If you can afford it, I highly recommend it especially because of the apparent knowledge of the support team and international supportability, which is a possible future need. Rated 1 out of 5 by Jimmy from 5ghz band turns Off & On This is the second (2nd) unit with the same issue. It's simple, the 5Ghz band just turns Off. You can reboot/restart the router, turn Off completely removing the Power for hours and still no luck. It turns on when it wants.. Yes, with latest firmware, yes, move channels around to channels not conflicting w/ other houses. The 2.4ghz band is still good but the 5ghz it's just gone.. :o( Use Acrylic to check SSID, channels other houses are on, speeds, etc. and gave you a second chance buy replacing with another unit. Well, it's going back to Sam's club to get my money back to purchase another brand. Rated 5 out of 5 by LongInThe Tooth from Really happy with my WRT3200ACM I wanted more bandwidth than I could get through my Linksys E2500. As both my wired and wireless speed tests have confirmed, the WRT3200ACM has delivered in spades. Setup was a breeze. I followed the recommended quick start process and was connected to the internet in moments. Configuring port forwarding was also very simple. Next, connect all of the wireless devices to the new SSID and it was done. All told about an hour for the complete process. I configured both 2.4ghz and 5ghz to the same SSID and like that each device can choose it's preferred band. Rated 1 out of 5 by Andrew from Do NOT buy! Hardware poorly made. Don't buy this thing. This has the same hardware build as the WRT1900ACS and the ethernet ports on the back will fail! This thing is poorly made. I went to unplugging a cable (yes I know how to push the plastic tab in to unlock it), and the metal surrounding the port pulled out with the cable. See the posted picture. This shouldn't ever happen. Upon calling Linksys' tech support the lady told me I was out of luck as it happened after the 1 yr warranty period. So now I'll be shopping for a new router and Asus will be at the top of my list. I was very disappointment with Linksys and their customer support, and they've lost a customer for life. †While Linksys fully embraces the open source community and is providing open source use capabilities, they do not offer technical support on using open source firmware. Installing 3rd party firmware is done at your own risk and replacing factory-installed firmware with open source firmware will void your warranty. Please always seek the advice of more experienced users via open source community forums if you’re unsure.